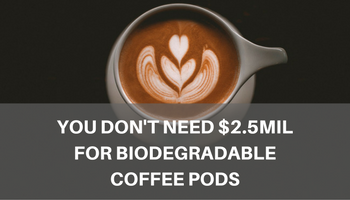 We read on July 5th, 2017 how Shark Tank Australia facilitated a deal to invest $2.5million into an Australian company that is setting itself to launch the ‘first Australian standard biodegradable coffee capsule’. We love to see others working hard to catch up to what Lucaffe has been doing for the last 20 years! We have written several times about the need to be smarter and more environmentally friendly when using coffee pods. The convenience of coffee pods, in general, isn’t going to go away and the ‘capsule’ market has been the worst offender in putting massive piles of waste into Australian landfills. Well, Andrew the world already has biodegradable coffee pods, they are called ESE pods, the ESE stands for Easy Serve Espresso and the quality of the coffee and the coffee experience is extremely high! So if you don’t want to have to wait to get exceptional espresso coffee in a biodegradable pod right here in Australia, through an Australian supplier you can simply go to our shop and order them online. You can read about how we recycle our pods here, and more about the pods here. The original Shark Tank article is here (read the article on news.com.au) as well as a follow up from some other coffee providers (read that article).